This month's challenge in the architectural theme is stairs. I live in a single story home! Except for a few steps out on the front porch, I don't have too much of an altitude change! I know that I am a home body and that the traveling bug has expired within me but I didn't realize how much so until I realized that every subject for this photography challenge, unlike the last one, cannot be fulfilled by taking shots of things in my house or yard. This morning when I was telling Mom how another whole month has passed and I didn't get out once for a photo, she said, 'Come on! We're going on an adventure!' I grabbed the camera and we took off in the car to find stairs! This month's challenge. These are the steps that lead to Mom and Dad's winter home. These back steps are where I would sit in the Spring when we would leave the northern snow to visit Bill's parents and my kids all played on these steps, too, to soak up some sunshine! On to the little town nearby! This church has some real stairs even if they don't climb very high! The town center has this gazebo with a few more steps! Arranged in front of the gazebo, where local talent strums for the crowd, there are several sets of risers which are another form of steps! Across from the park is a beautiful home with a few steps up to the front door, which is a pretty common type of home. A few of the older homes have an outside stairway leading to an apartment. One of our restaurants has this set of stairs for coming down from the eating area to walk out onto the pier. When we arrived back to my house, I remembered I had another set of steps that I enjoy daily-the steps to my pool patio! And the favorite set of stairs lead right into the pool! I am grateful for a loving parent's encouragement still so I could participate in this challenge in the right spirit! Thanks! 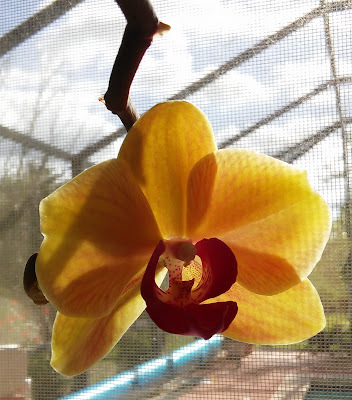 A few years ago, Marsel and family gave me this King Orchid for Mother's Day. It has blossomed once but this Spring, it is going to out-do itself! There are five stems of buds! They slowly begin to split. And then there is a spectacular bloom! I am so excited to see them! Yesterday, I finally made a batch of soap with Mom! This one is Oatmeal, Honey and Peppermint! This morning I sliced them and now they will set out to cure for a few weeks! Then I will trim and label them and they will be ready for use or sale, whichever comes first! I divided for the body of the sweater. It is always a big step to get off those shoulders and onto the shorter rows of the body when working a top down sweater! This morning I had fun using up the last of the curtain fabric to make some matching pillows in the family room. I have been meaning to do this for a few years! I finished knitting the Zuzu's Petals Cowl! The whole time I was knitting it, I had that sinking feeling that it wasn't going to turn out. This is a good example of lace knitting needing to be blocked also! It is pretty hard to see what I have even off the needles! But against all odds, the cowl turned out beautifully! I am thrilled with it! I am awarding myself the Gold on this one! I am finished with my Ravelry Olympic knitting! And so I immediately cast on another project, this one a sweater called the Vodka Gimlet! Crazy name but a great looking sweater! 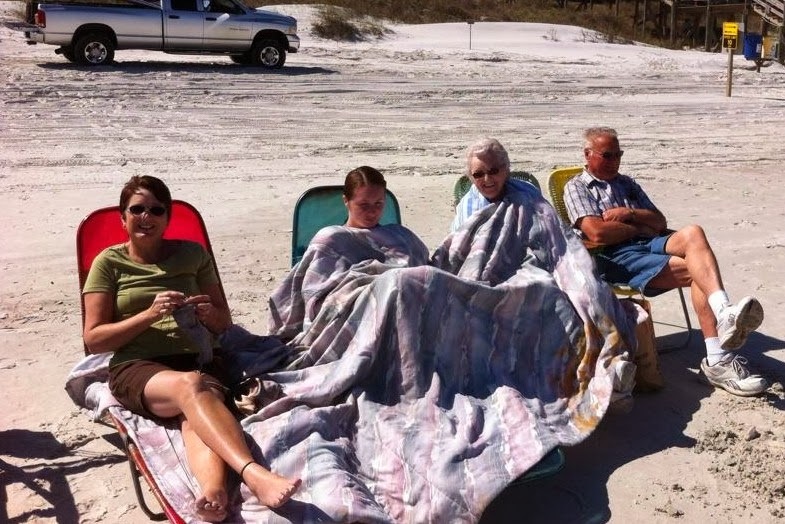 Thursday, the majority of us headed to the beach! I am happily knitting! The wind was a bit nippy when we first arrived! The kids knew how to have fun without any encouragement on our part! They both have so much imagination! I love it! They had good helpers in their Aunt and Uncle! I think this was one of their favorite beach activities, though. David wants to bring more crackers for next time! On the way home, we stopped at the vegetable stand. We even bought some strawberries for shortcake.......yum! I finished the Shetland yarn mitts for Marsel! They are so much lighter than the Cormo yarn I used for the last pair. I must say, it is a good knit! Bruce, Marsel and kids left for home this morning.......I need some knit therapy to console me. I can't believe it has been a week since I posted! I finally lost the headache...pain pills from the doctor stopped the cycle finally-that was a 8 week long headache; a personal record I have no desire to break! I am still knitting on the cowl-I am in the lace portion and it requires more concentration than a house full of company affords! So I cast on a pair of my fingerless mitts since I can do them almost without looking! Thursday, Bruce and Marsel and the grands arrived for a week long visit! Friday, Caleb and Cassandra and Ella arrived for the weekend....Saturday, Matthew, Ashley and Will came! We went over to my parents (2 miles from us) and spent the day because my sister and her family are here for a visit! They are enjoying the break from the hard New York winter and we are not disappointing them with the brilliant and warm spell we are having! We had a great time catching up with each other and watching the kids all run around and play. Oh, yes; the food was great, too! Marsel and I got to do some sewing today-Bill and both of her kids are down with the 24 hr stomach flu......we grab the minutes when we can! See how funny the hat looks when it is finished being knitted?! Then you fold up the brim and you have a very classy hat! Or two very classy hats! Ta Da! The Downton hat is finished and it was so much fun to knit! I couldn't wait to cast on another one! Mom's quilt is off the frame; I sewed the binding on the front for her and now I will pass it back to her to do the hand sewing. I tossed it on one of my beds to give it a preview! It is a fun challenge to set a goal and push yourself to knit it (or spin it or whatever...) during the Olympics. Lots of knitters/spinners join Ravelry for a good competition during this time. I didin't join in this time but I did set a personal goal and have a pile of projects to keep me knitting in overtime! This is the Downton Hat. I made good progress on it yesterday and am ready to begin the brim in the contrast color today! Bill and Dad did some maintenance on the nails on the roof-covering them in silicone to prevent leaks. A new roof in in the future! This is why the yellow house is also called the "train house!" The trains go zipping by about 100 feet from the side of the house! Woo, woo! The River looked very inviting and there were several boaters and jet skiiers except when I took this picture...! These are some cypress knees.......they look very cool, don't they? We went back to Dad and Mom's for games , a walk and then some strawberry shortcake! So nice to spend the day together!